Mosaic medallions are perfect as a center piece in any room or in a hall way. They are perfect for table top mosaics. You can use them just about anywhere. They also look very good embedded in hard wood floors. 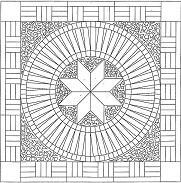 Here you will find some mosaic medallion patterns. Just click on an image to get it's detailed pattern. You can select from these or use them to inspire you to create your own medallion templates. If you find one you would like to create, contact me indicating which mosaic template you like and I will gladly resize it for you for a very reasonable rate. I will also explain the easiest way to cut all your pieces producing the least possible waste. 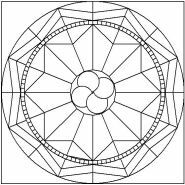 This is the pattern for the medallion on the home page. The most complicated part to cut is the border around. This one took me about 25 hrs of work for a 36 by 36 inch size. Mosaic medallion pattern number 2. Click image to get detailed pattern. 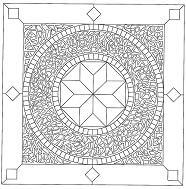 Mosaic medallion pattern number 3. This is a very large medallion, 48 inches in diameter. Click image to get larger pattern. If you want the details for this one please contact me and I will send them to you. Remember, if you need help please use the contact us page and send me your request. I usually respond within 24 hours. As I create more patterns I will make them available to you, so come back to this page often!